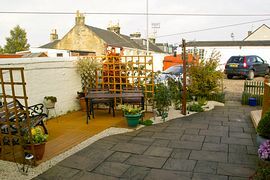 Patio and decking areas for guests use. We are very close to the beautiful walks of the River Ayr. Afton Villa offers accommodation on a Bed and Breakfast basis. 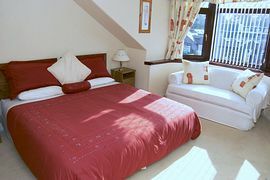 We are a family managed small bed and breakfast offering bedrooms with en-suite and private bathroom. 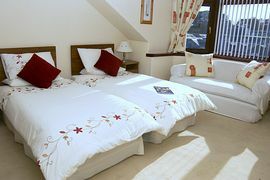 All rooms have the facilities you would expect in a well managed B&B ie: freeview television, hospitality tray, radio alarm clocks, hairdryers. There is private parking to the rear of the property, gardens to the front and rear for guests use, where there is seating on the patio and decking areas with tables. We have a double garage with ample space for guests to store golf clubs, bicycles, and motor bikes. 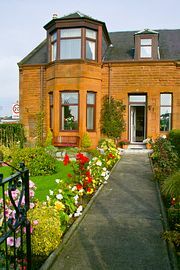 Afton Villa is situated across from the Ayr Premier Racecourse and the Western House Hotel. The town centre is within walking distance, where all local amenities can be found as is the Ayr beach. There are ample golf courses in and around Ayr and Prestwick, just a short drive away. Turnberry Golf Course and the famous Royal Troon are also only a short drive from Fayre Villa. There is plenty to see and do in and around Ayr, with the Burns Heritage Centre, Ayr Farm Park, Culzean Castle, Rozelle Country Park with the Maclarin Art Gallery. The Northfield Bowling Greens are a short drive or 12 minute walk from Afton Villa, with other Bowling Greens even closer. Minimum £22 per person per night. Maximum £30 per person per night. Smoking Facilities: Smoking is not allowed. There is smoking bins for guests use outside at the front and rear of the property.